← Ryan Harrison Struggles to Keep His Cool Down in Atlanta. Harrison Enters ATP Top 100 and Atlanta Semis With Thrilling Three Set Win. 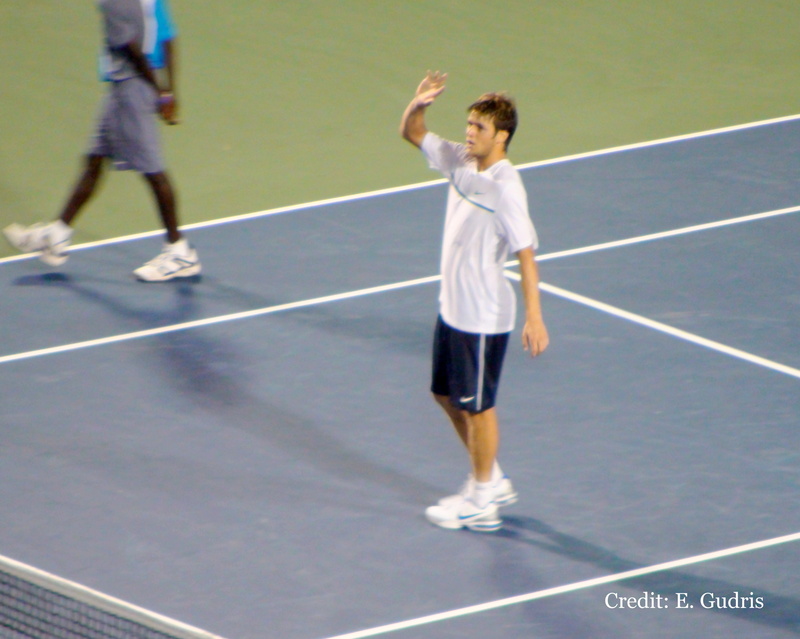 Ryan Harrison Waves to the Crowd in Atlanta (Gudris). Quarterfinals day at the Atlanta Tennis Championships saw a few surprises in who advanced into the semifinals and how they got there. Even though rain threatened to derail what looked like an easy straight sets win for the top seed Mardy Fish, it was the last match of the evening that provided real drama for fans of young American Ryan Harrison. Gilles Muller kicked off the afternoon with a surprise upset of No. 2 seed Kevin Anderson with a 7-6(3), 7-6(3) victory. After that, last year’s finalist John Isner cruised over Yen-Hsun Lu 6-1, 6-2 in just under an hour in a match that saw Isner completely overwhelm his opponent. The night session saw top seed Mardy Fish up against Somdev Devvarman. Fish couldn’t find his range early on and overhit many shots, racking up 22 unforced errors in the first set alone. But he played steady enough when needed to claim the first set 6-4. Fish cleaned up his act in the second set and leaped out to a 5-0 lead. But as a few drops of rain fell during the last few games, Fish rushed to get off the court, blowing several match points against Devvarman’s serve and then started overhitting again to let Devvarman back in the match at 5-3. Before a brief shower hit the court, Fish did manage to serve out the match 6-4, 6-3. But it was the final quarterfinal match between young American Ryan Harrison and veteran American Rajeev Ram that proved to be the highlight match of the day and the week so far. Ram, with his silky prowess at net claimed the first set 6-4, but his inability to hold serve in the second set along with more assured play from Harrison saw Harrison claim the second set with ease. The final set proved to be a real battle with both men involved in hard rallies on the baseline and delightful exchanges up at net. Serving down a match point, Harrison bombed an ace and then eventually forced a tiebreak. After Ram’s forehand failed him on several points, he allowed Harrison to jump out to a 5-1 lead, Ram fought back to even things at 5-5. Harrison knifed a backhand volley to force a match point at 6-5. The next point saw Ram charge the net but Harrison responded with a backhand pass that clipped the net and sailed past Ram to land in on the baseline, giving Harrison the victory 4-6, 6-1, 7-6 (5). Harrison’s hard fought victory Friday night not only earns him his first ever ATP semifinal berth against Mardy Fish tomorrow but also gave the young American some special rewards as well. Along with a special exempt entrance into next week’s Farmers Classic in Los Angeles , Harrison will now crack the ATP top 100 for the first time next week. Comments Off on Harrison Enters ATP Top 100 and Atlanta Semis With Thrilling Three Set Win.